There are a variety of places to stay in Kimberley: ski-in ski-out, on-mountain, in town, hotels, condos and house rentals. 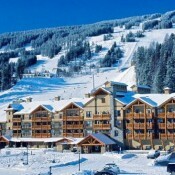 The ski hill is located only 5 minutes (3 kilometers) from the town, and offers a regular shuttle to a from. Trickle Creek Lodge is the favoured ski-in, ski-out lodging property in Kimberley, boasting 4.5 star lodging in condo style, complete with pool, hot tubs, exercise room, 2 restaurants, stunning views and of course, ultimate convenience.